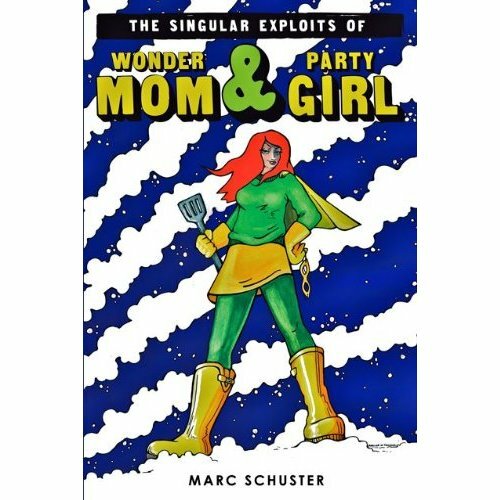 The Singular Exploits of Wonder Mom & Party Girl , by Marc Schuster. Publisher: The Permanent Press (June 1, 2011). Literary fiction. Hardcover, 280 pages. Was I all that different now that I had been high a few times? A little more open-minded, I told myself, checking the mirror for telltale signs of what I was up to. A little more relaxed. A little more daring. A little more willing to let the small things slide. But in the final analysis, I had to insist that I was the same woman I’d always been. Smart, self-assured, responsible Audrey. Audrey’s husband left her for a younger woman although he insists that she remains his best friend. Taking care of her two young daughters and editing a local food trade magazine, Audrey plays by the rules. She’s a good person. This is not a predictable story about a divorcee coping with change. The Singular Exploits of Wonder Mom & Party Girl is a refreshing novel about a woman facing the realities of getting older and losing her comfort zones through divorce. Using wit, situational humor and deft observations, author Marc Schuster constructs a fast-paced story with various twists. One night when she’s out with a co-worker, she tries cocaine and soon finds she really likes it. She also dates a local restaurant owner who enjoys dabbling with drugs. He encourages her drug use and introduces her to jazz. But in the end he’s not that reliable. Audrey’s Wonder Mom by day and Party Girl at night. Soon the lines blur and she’s a real mess. Audrey can no longer keep her dark secret. She’s dealing and snorting cocaine, working and taking care of her daughters. It’s overwhelming. While becoming a drug addict may be extreme, Schuster uses it as a metaphor for many quick fixes that Americans use to solve their issues. The Singular Exploits of Wonder Mom & Party Girl hovers between amusing and tragic but doesn’t cross the line too much in either direction. This entry was posted on June 17, 2011, 10:50 and is filed under Books. You can follow any responses to this entry through RSS 2.0. Both comments and pings are currently closed.